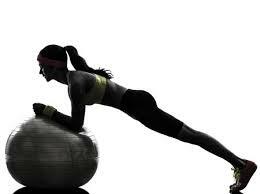 This week’s exercise is going to be a great core exercise, Stability Ball Stir the Pot. This exercise requires a great deal of core stabilization, anti-rotation, and some hip stability all at the same time. Below is the description and a video of how to do the exercise. 1) Grab a stability ball and place it on the ground. Kneel on the floor and place your forearms on the stability ball. 2) Brace your abs while extending your legs to lift the knees of the ground. You should now be in a plank position. From here, push your wrists gently into the stability ball. 3) Keeping your abs braced, make small circles with the stability ball in a clockwise direction while preventing any rotation in your hips and back. 4) Repeat in a counter-clockwise direction. 10-15 reps/circles per side. 5) Use a slow controlled motion so you can feel you abs stabilizing your spine. If you want to make it more challenging, use a smaller stability ball and/or make your circles bigger.